Description: This young course opened over the 4th of July weekend back in 2009. It is a very scenic layout that seems to be well-sculpted from the natural terrain out in Locust, NC. For now, there are very few homes built and I'm sure that eventually they will change the nature and aesthetics of this quaint course. In the meantime, it's a quiet but adventuresome round of golf. Over the course of 18 holes, you face many different challenges, from long, forced carries to shorter, target golf approaches. There are plenty of water hazards in play with ponds and creeks. The greens feature "velvety MiniVerde" grass, which is supposedly well-suited to the warmer climate to stay in top shape year-round. Notes: The temporary clubhouse has a nice large deck for enjoying a drink on the 19th hole. Not sure when the permanent one will be built. The parking lot and many of the cart paths are gravel still and haven't been paved yet. Within a year of opening, they re-routed the front 9 and it was a welcome change. Your round used to start with a short par 3 (now the 5th hole) requiring only a wedge shot. B-Man's Take: This course is one of the most unique in the area and most people will either love it or hate it. 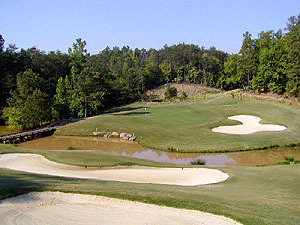 It is a fun layout with 5 par 5's and 5 par 3's. Several greens have multiple tiers or challenging slopes, making for some occasionally diabolical pin placements. Many holes also feature significant elevation changes and rolling hills, almost like a mountain course. 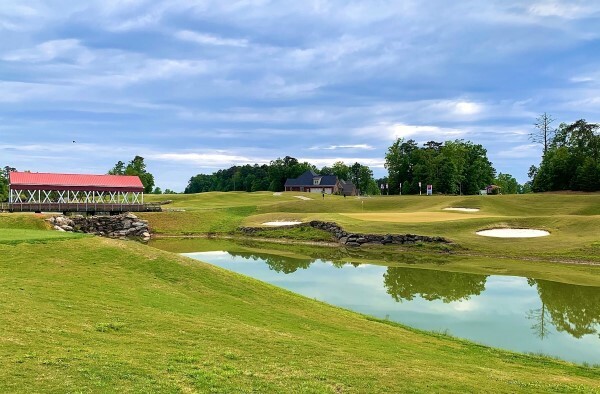 The 18th hole is notorious for being one of the longest and toughest holes in town. It is 619 yds from the men's tees (650 from the tips!) and requires an uphill, hazard-crossing final swing of at least 120 yards. The 17th hole made me say "wow" -- a short, downhill, dogleg right 326 yd par 4 that has small green protected by a water hazard. You have to play target golf on some holes, but most have generous landing areas for your tee shots and approaches. Overall, my rounds here tend to be memorable and the course is definitely a must play.